BUFFALO, N.Y. (AP) -- The NFL has its first full-time female coach. 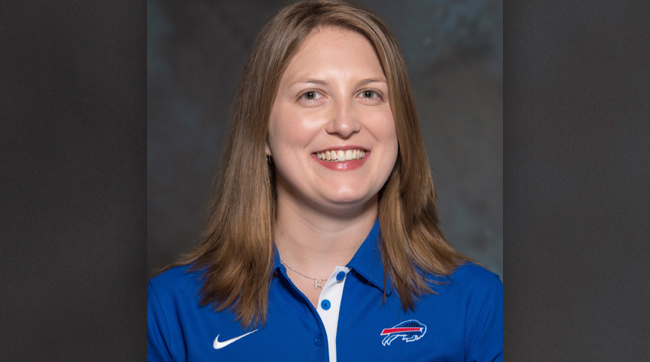 Smith is well-known within the Bills staff after spending this season as an administrative assistant for the team's assistant coaches. She spent the past seven years working alongside Ryan. She was the New York Jets player personnel assistant when Ryan took over as coach in 2009. Smith then served as Ryan's assistant in 2014, his final year in New York before he was fired and then hired by the Bills. Bills offensive lineman Richie Incognito expressed his support for Smith in a tweet. "Congrats Kathryn!! I know you will do a great job," Incognito said in a post that included a thumb's up and smiley face. This is not the first time the Bills broke the gender barrier. Linda Bogdan, in 1986, became the NFL's first female scout, when she joined the team's player personnel department. Bogdan, who died in 2009, was the daughter of late Bills Hall of Fame owner Ralph Wilson. The Jets promoted long-time executive Jacqueline Davidson to director of football administration last season. She was previously the team's manager of football administration. Dawn Aponte is Miami's executive vice president of football administration, and has been involved in the front offices of the Dolphins, Jets, Browns and the NFL for 25 years. Among others on a quickly growing list of high-ranking women in NFL franchises include Katie Blackburn, Cincinnati's executive vice president; Jeanne Bonk, San Diego's executive vice president and chief financial officer; and Hannah Gordon, San Francisco's vice president of legal and government affairs. But Smith's promotion is the latest step for women getting a chance to join the coaching ranks of North America's major professional sports. In August 2014, former WNBA player Becky Hammon was hired by the San Antonio Spurs to join coach Gregg Popovich's staff, making her the NBA's first full-time paid female assistant coach. In promoting Smith, Ryan said he consulted with Cardinals coach Bruce Arians. Smith has 13 seasons of NFL experience, and began her career in 2003 as a Jets game-day/special events intern. Two years later, the Jets promoted her to become a college scouting intern, and eventually became the team's player personnel assistant in 2007.